Long time member here that has been away for a while. Currently sat in a coffee shop while my 98 Esprit V8-GT is up on a ramp, potentially facing a watershed moment. I'd booked it in for an inspection (I don't get it serviced as such as I do so few miles and didn't anticipate selling the car so I don't feel the need to get the book stamped) which has ended up showing all manner of stuff corroding that hid hitherto not come to light. Not quite sure how this had not come to light at previous inspections or even how it passed previous MOTs but that's another story. I'm awaiting an indication of price but it could end up being a huuuuuge chunk of the car's value (whatever that is), and may mean that I face a big decision as to whether or not to make the investment or call it a day. Use them or loose them Tim, V8 Esprits when rusty underneath can get very costly, Check out Barry Kearlys thread on here along with others regarding what may need doing, The high mileage cars seem much better imo, and the ones that have sat do not tend to look to good underneath. Is yours kept in a warm garage or left out to the elements ? Yep, just spotted that thread, very pertinent! Always garaged, and hasn't seen rain or salt in years. I generally take it out at least once a month, far more in summer, but has sat for up to 3 months in the past due to my no salt / rain policy. The rust that's been discovered will have been building for years and will be a legacy of having been a daily driver back in the day. Still sat waiting for the quote. Decided that I'd miss if it was gone, undecided how much would be too much....!! Just get the spanners out Tim and restore the underneath a bit by bit, this will spread the cost of the bits needed and you will get to know your car inside out and save plenty of money at the same time on labour. Plenty of folks on here who know the v8 inside out and will offer you advice along the way. I'm with @silverfrost on this. One of the many great things about these cars is that they can be dismantled from the chassis leaving the body on quite easily and all the bits can be given a nice re-coat of whatever. Hopefully your chassis is in decent order. I've just stripped my near 40 year old S2 down and even though the chassis is not galvanised, it's in remarkable condition! So...... somewhere in between would be my estimate. IIRC theres a chap on here running a v8 with over 200,000 miles. Many guys are just dialling it in, and don't care. In short whoever was inspecting it before was the wrong guy. Anything's fixable, it's just a matter of attitude and appetite for it. Whats the cheesy line from the movies... "...if it's true love it's never too much." Thing about salt is that in solution it can get into every seam, nook and cranny. When the water evaporates the salt is left behind only to continue creating problems any time it gets damp again. The ideal would be to get the chassis out and properly stripped and treated. Def worth it if you have a no wet days policy. One Q: weren't all chassis from the S2.2 on galvanised? Why is this late car rusty? A decent galvanising job should last 30 years min. So the quote came in at £7-10k. Seems a lot to fix a bit of rust but then from the 10 minutes I spent underneath it there is a lot of rust to fix! Nothing chassis related but fuel pipes, oil pipes, coolant pipes, oil coolers (not the coolers themselves, the fittings but apparently tricky to remove without damaging the cooler), one of the wishbones, probably a load more that I've forgotten.... All to be expected on a car of that age I guess but odd given I had work done on the turbo pipes not too long ago and none of the other stuff had been flagged. George - perhaps you're right. Anyway, pretty much made my decision on the drive home as I delayed gear changes and enjoyed the pops & crackles on the overrun. Where else am I going to get a car that looks, feels and sounds as cool as this for £7k (OK, maybe £10k plus whatever I could get selling a car that needs potentially £10k of work doing on it!) Man maths aside this is a car I've wanted since I was about 10 years old and whilst I could consider that I've ticked the box it's still my dream car and nothing else comes close. And then reverting to the man maths, anything spent is effectively an investment, right?! Dan, Daniel, Vanya - I hear you on the do the work yourself point but I dont have the tools or the time to do it myself. And even more importantly I'm a complete mechanical novice and dont have the skill! Now I know everybody has to start somewhere, but then see my point about the tools and the time. Anyway, I'll provide some brief updates, not least if any useful information pops up while the work is being done. The garage is busy until October so I'll be off the roads for a while. I thought that all of the pipes for the coolant were alloy and should not be rusting? Tim, you don't sell a long time friend, do you? Dissimilar metal corrosion means aluminium alloy will come off worse than steel in a situation where there's moisture, salt and an electrical charge. Considering how advanced the corrosion sounds Tim, maybe having them check for errant wiring is an idea too. On a side note, I believe corrosion is the reason positive earth was abandoned way back. Seemingly negative earth is less inclined to dissolve the metal in a car than positive. Its very difficult to get a categorical answer on this though. Definitely get her fixed! And maybe look around for other quotes. If it's not a daily driver and can be missed for some time, I'm sure there are some options besides doing the work yourself. Are you restoring the car or just doing safety/remedial work? - as I'm struggling to think of many areas of an Esprit that suffer from terminal safety related corrosion - apart from the tanks. Sure you will have problems if you come to replace oil coolers or turbo oil feeds etc, but do they need replacing at the moment, or are they an imminent risk to reliability? If it was mine, I would consider putting it in for an MOT and see if any safety issues involved. If not, I wouldn't get overly concerned at the moment. Unless a garage is offering some kind mega deal (it doesn't sound like it....) Why pay 10K in a single hit for potentially cosmetic work (unless you want to of course). Can we see some photos of the worst affected areas? As above the bottom line is that the car is going nowhere. So with regards to the original question, the answer is >113k miles and 19 years. Seems entirely obvious now. My issue now is whether to get the work done straight away or get a second opinion, and I think I know the answer to that too. The guys I took it to yesterday, who I wont name, seemed 110% straight & competent and are highly recommended on [another Lotus forum] but are fundamentally Elise & Exige specialists. It also doesn't make sense that the place that did the inspections / services didn't mention anything but they have recently sold up so I cannot talk to the guys that worked on the car. So I think my query is now: recommend me a garage. For practical reasons it has to be fairly local. I'm literally 1 minute from Hilton & Moss / Castle Sportscars in Bishop's Stortford but haven't heard good things although may stick it in for an MOT as suggested above by Steve anyway (Steve - it's 100% a safety/ maintenance issue). I also know of Stock's Coachworks which is reasonably local and have been to Mark way back when. With regards to the questions around corrosion as I mentioned it was primarily pipes. The item that scared me the most was the fuel pipes and I attach a photo, although on closer inspection it looks as though it's an outer layer that's rusted, I don't know the construction of the pipe. Definitely get a second quote. It's sometimes worth traveling a bit as it can bring thousands off the final figure. Esprit Engineering are now servicing V8's, as the mechanic from Sportomotive is working there now and he specialises in V8's. 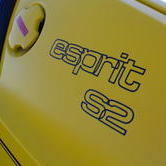 I've had my Esprit serviced there for 15 years, Geoff always does a good job and he doesn't rob you. Took it in for an mot.... and it passed! So I've bought myself a bit more time and can now drive it to wherever I decide to go rather than having to stick it on a trailer. I made the long trek to see Geoff at esprit engineering at the weekend and was pleased to be given a clean bill of health. Well, a few observations; one of the turbos will need some work in the medium term, I need to replace the front tyres, and yes, some of the pipework should be replaced as & when other jobs are done, but no red flags. Very pleased to have made the trip. And after spending over an hour prodding around my car Geoff tried to refuse taking any payment. Oh, and he spends his spare time repairing aeroplanes, definitely the kind of guy I want working on my car! Good to hear. Geoff fixed a mates V8 a few months back. 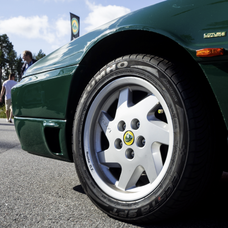 The car had only a few thousand miles on the clock and had stood since 2001 in a Dubai garage. Condensation had built up in the tanks and they'd rotted, so Geoff replaced them. Why anybody spends top dollar for a very low mileage car is beyond me. Another good reason to use your Esprit regularly. Mark was that the Esprit that featured in a Youtube video not so long back? Yep you beat me to it.